Getting a mortgage can be a frustrating process for many. Paperwork, documents to be filled out, a mound of information to remember and decisions to be made. At Assured Mortgage Services, we make this process easy. Now, don’t get me wrong there is still a lot of info to remember but we document all of that for you, provide you with all of your info and keep it on file here for you as well! We are your mortgage broker/partner from start to finish and not just for the first term… for the duration of your mortgage years. 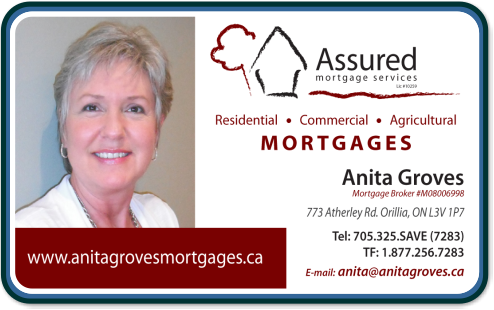 On our website www.anitagrovesmortgages.ca/ you can access information on home purchasing, getting a qualified pre-approval, use our mortgage payment calculators, find links to related industry information and much more. If you are thinking of purchasing, renewing your current mortgage or accessing your home’s equity, call me. Complete my online application form and I’ll contact you the same day to discuss your options and let you know up front what the lender will expect and require to move forward. If you or someone you know have questions regarding mortgage financing I would more than happy to help. Call me today and talk soon!